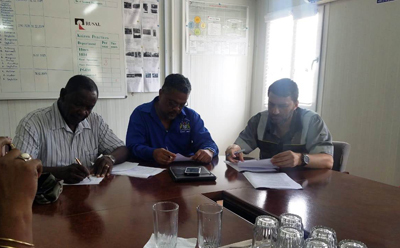 Five weeks after a historic standoff, Rusal workers in Berbice have removed a barricade across the Berbice River, in Kwakwani, and agreed to return to work was early as tomorrow. For the 91 workers who had their services terminated, they will also return, but not be paid for the time not worked. Union and Rusal officials yesterday shortly after the signing of the Terms of Resumption. These and more are included in an agreement signed yesterday at Aroaima, Region 10, one of the Berbice locations of Rusal/Bauxite Company of Guyana Inc. (BCGI). It was described as the longest industrial action in recent times. Workers were celebrating after. They had taken on one of the biggest companies in the world. 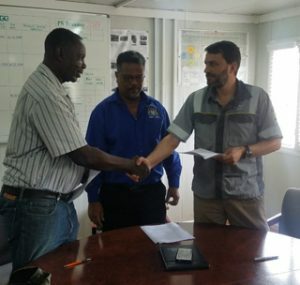 According to the Guyana Bauxite and General Workers’ Union (GB&GWU), the signing of the terms of resumption (ToR) includes reinstatement of all 61 dismissed workers and those laid off during the dispute – some 30 more. It was agreed that there will be no victimisation or change of conditions for the reinstated workers. There will also be “no compensation for time not worked during the dispute”. The ToR agreed for the return of the check-off system and clearing of the Berbice River. It was also agreed that a subsequent meeting will be held within 14 days following the full resumption of work and that the union and company will commence negotiation of a new Collective Labour Agreement (CLA). According to the union yesterday, the workers’ struggle with Rusal, a Russian-owned company, is second biggest bauxite purchaser in the world, really began on 22nd November, 2009. It has “ended after approximately nine (9) years, three (3) months, and twenty-eight (28) days. The recent industrial conflict from February 15, one (1) month and four (4) days”. The union made it clear that in the history of independent Guyana, this is the longest industrial conflict on record – occurring under the Bharrat Jagdeo regime, and continuing under the Donald Ramotar rein. It was only resolved finally under the Coalition Government. The union in expressing gratitude to Government, unions, media and workers and their families, noted that it was a hard-fought battle with miles more to go. Meanwhile, the company said that it has no confidence in Mohamed Akeel, an advisor to Rusal, who was also a former Chief Labour Officer. The union pointed out that Akeel, who has more than 25 years of service with the Labour Department, knows better yet failed to adequately represent the Laws of Guyana protecting the rights of BCGI workers. “This brings into question the quality/efficiency of his performance and whether he is best capable of serving the interest of BCGI and the union in upholding the signed agreement. Meanwhile, Rusal in a statement, announced that BCGI, in which it has a 90% stake, has signed an agreement, to settle the labour conflict between both sides. Rusal said that the agreement further outlines that within 14 days of the full resumption of work, the parties will commence negotiation of a new collective labour agreement. BCGI was founded in December 2004 under the agreement between Rusal and the Government of Guyana. Rusal owns a 90% stake in the company, whereas the remaining 10% belongs to the Guyana Government. However, Guyana never received any dividends. It has been learnt that Rusal has received years of tax breaks and other concessions but still not made a profit. It fired 57 workers in 2009 – that matter is still unresolved. Until recently, and for more than decade, it refused to deal with the union. The company employs 543 people. In addition, Rusal says it owns licences to develop Kurubuka, Kwakwani and Ituni deposits groups in Guyana. 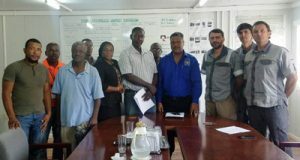 Gathered at Aroaima for the signing yesterday were GB&GWU’s General Secretary, Lincoln Lewis, union officials, Chief Labour Officer, Charles Ogle, and representatives of Rusal/BCGI. Shortly after, the barricades placed across the Berbice River to block Rusal from shipping bauxite were removed.